Note: A Half wrap and Horn Button are shown installed on the steering wheel for illustration purposes but not included. To complete the steering wheel assembly requires the additional purchase of half wrap, adapter, and horn button. 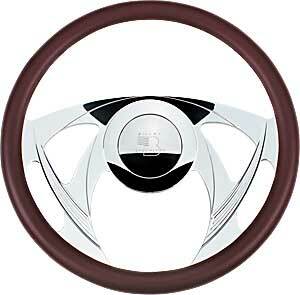 Billet Specialties offers the products to create a custom steering wheel. Each 14" steering wheel has a polished billet aluminum center (except #135-BLK30103 is black) and half-wrap design with machined finger grips. Just choose the wheel pattern and wrap you like best. Note: A Leather half wrap and horn button are shown on the steering wheels for illustration purposes but not included. To complete the steering wheel assembly requires the additional purchase of half wrap, adapter, and horn button.